Cliona Hagan will perform in Inniskeen, County Monaghan at Countryfest Festival! You can find the Event on Facebook for more information / ticket details. Cliona Hagan will headline the Strongman Farmer Style Competition at the grounds of Raphoe Livestock Mart in Donegal. Following on from her stint and reaching the Final of RTÉ’s Dancing With The Stars, fans will get the opportunity this year to see Cliona headline her own ‘Dance On Concert Tour’ which include dates in Armagh, Strabane, Ballymena, Westport, Cavan, Offaly and Killarney. Performing fan-favourites including Born To Run, 1-2-3, and McCarthy’s Party, Cliona says she “can’t wait to get back onto the road again to see all the people who have supported [her] over the past few months”. 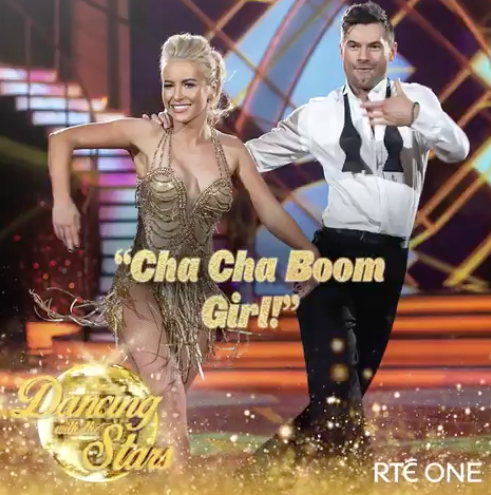 After dancing week-in, week-out to a Live Audience and millions across Ireland on Dancing With The Stars, Cliona might just have a few new moves in store too! Sunday saw Cliona & Robert through to the FINAL of Dancing With The Stars! Cliona danced all she could, performing both a Viennese Waltz and Cha-Cha in the hope her fans and the public would pick up the phone, and she wasn’t disappointed being the first name to be called a FINALIST. Cliona said after: “It’s mind-blowing. I never thought I was going to be in the final. I’m so grateful, so happy and over the moon. I’m in shock”. Along with Mairead Ronan and Johnny Ward, Cliona & Robert are rehearsing their most important dances of the series this week – as this Sunday night will crown the winner of the Glitterball trophy. Cliona spoke of her time on the show this week, “you have to always not let fear rule you and hold you back.. that’s my motto in life. I have not been in my comfort zone when it comes to dancing, but I’ve given it my all, everything, blood, sweat and tears”. Speaking of wanting to win, Cliona said she would love to “represent and be the first Irish Country singer AND female to win the show”. TEXT CLIONA to 53125 when voting opens during the show / RTÉ 1 6.30pm. A step closer to the Glitterball for Cliona and Robert as Sunday saw the pair through to the semi-finals of Dancing With The Stars Ireland! It was Eurovision week – and Cliona danced to an upbeat, quirky Charleston to Puppet on a String by Sandie Shaw. Cliona said after the result that she was “absolutely delighted and over the moon” to get through to the semi-final, as she talked about how her nerves really kicked in before her name was announced. “I’m so happy to be standing here and still so grateful for the support”. “I never think of lifting that Glitterball, don’t get me wrong, I’d love to lift it but it’s anybody’s game, and I’m just going to make sure I do the very best I can. Cliona is now set to take part in the semi-final alongside Johnny Ward, Fred Cooke and Mairéad Ronan next weekend, when it’ll be a busy week ahead for the stars with 2 dances to learn and perform. VOTE Cliona to the FINAL! Text CLIONA to 53125 when voting lines open during the show next Sunday 6.30pm RTÉ 1 Dancing With The Stars. A ‘sizzling salsa’ – Cliona and Robert received 25 from the judges this week, as they impressed yet again to be second on the leaderboard. Sunday also saw Cliona team up for a group dance for the first time, with Clelia Murphy and Denis Bastick as they competed against Mairead Ronan, Johnny Ward and Fred Cooke — with points from the group dance added to their total scores. Cliona said of this week’s morale, “we’re all upbeat and positive and having a ball”. Cliona was also in high spirits this week as she celebrated her milestone 30th Birthday, returning home to a massive welcome! Cliona and Robert visited her very own Derrychrin Primary School were she was presented with her FIRST cake of the week – and after Cliona’s sassy Salsa on Sunday – the Dancing With The Stars team surprised her with yet another cake, in front of the audience and millions watching at home. [Cliona Hagan will return to DWTSI next Sunday RTÉ ONE at 6.30pm]. Last Sunday night was a ‘dream come true’ for Cliona performing with the award-winning RTÉ Concert Orchestra. Cliona and Robert didn’t put a foot wrong with their elegant waltz to ‘A Time For Us’ where Cliona was awarded the ultimate 30 by the judges, being a first in the series so far. Complimenting on her stunning performance, judge Loraine Barry said: “I always feel like waltz is the hardest dance to master and you both made that look easy for you tonight”. After her performance, Cliona said that dancing to live music by the RTÉ Concert Orchestra helped her when it came to mastering this routine; “There is something about live music it goes straight into my bones, the Orchestra were stunning, it was so amazing for me”. 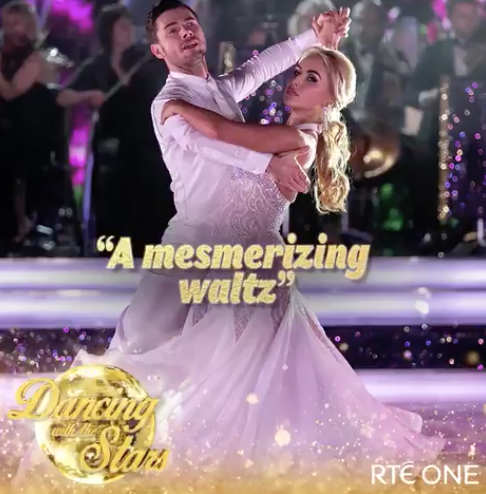 With reference to the ‘A Time For Us’ song Cliona waltzed to, judge Brian Redmond gave high praise – “you really stepped up – if you keep putting those performances in like that Cliona, I think it could be a time for you”. Sunday saw Cliona return to the dancefloor with Robert Rowinski as they fiercely tangoed to Ava Max’s Sweet But Psycho hit. Cliona topped the leaderboard with a combined score of 53, which included the results from last weekend – when Cliona got the first ten of the series! Cliona talked this week about being a role model and inspiration for young girls – “I came out of myself to become a singer and I want to inspire other people to follow their dreams. Country music is for real people and I’d like to let young girls all over Ireland know they can do this too. Don’t let fear hold you back”. High profile country stars have advocated their full support for Cliona on social media, which she says ‘has blown her away’ including the kindness of the ‘people all over Ireland’. “This has made me realise that when you put yourself ‘out there’ and do something that’s not in comfort zone – you can be surprised by how much you can achieve and the support you can be given along the way”. An ‘OMG’ and the first ten of the series saw Cliona and Vitali Kozmin the winners of Dancing with the Stars Switch-Up Week. No one was eliminated at the end of this special edition of the show – but the votes did count, as the scores will carry over to next week’s show, when the dance-off returns. With a total of 28 points – including the first ten this season from Julian – Cliona and switch-up partner Vitali were the judges’ favourite on the night. Cliona has said of the time and effort she has put in week after week, is to do her voters proud – “It’s true, I am working so hard because I really want to do my best for the whole country — not just my county. Text CLIONA to 53125 when voting lines open during the show. It was a sentimental dance on Sunday night for Cliona as her and professional partner Robert danced to Shania Twain – a favourite of Cliona’s from when she was a young girl first starting to sing. 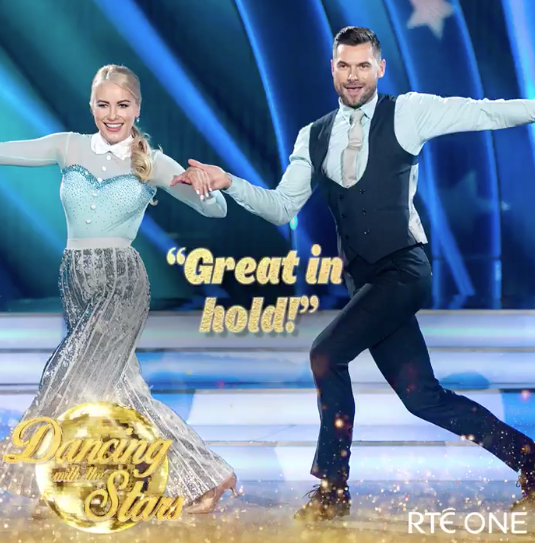 “Great in hold”, Cliona was given great, constructive feedback from the judges scoring a total of 22 – beating the last 2 weeks’ dances, and ending up second on the leaderboard. An early Glitterball trophy at the Sunday World Awards this week for Cliona, being handed yet another Award for Female Vocalist of the Year, three years in a row! Cliona entertained the Sunday World audience performing a medley of her hits, and before leaving the stage, received roars from the crowd to dance – alongside professional partner Robert, which they delighted in showing a few moves from their latest dance. Cliona and Robert looked very glamorous as they took on ‘Movie Week’ in Dancing With The Stars Ireland this weekend. Cliona channeling Elle Woods from Legally Blonde danced to a lively jive, keeping consistent for the second week in a row scoring 21 from the judges. 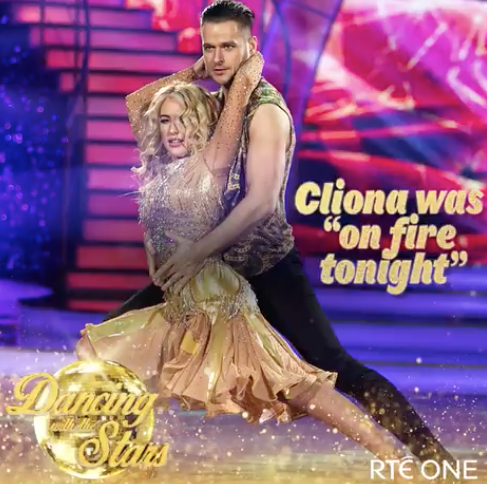 “A perfect pairing”, Cliona and Robert are still amongst the favourites to WIN – but only if her fans keep voting, by texting CLIONA to 53125 during the show. This week Cliona said she wants the public to learn that Irish country music isn’t just for those who are ‘60 plus’, saying “gigs are regularly packed with young revelers”. Cliona told the Irish Mirror: “It’s funny because Irish country music is really perceived as being for a certain generation of people, for example, 60 plus. Fair enough, older generations go to the concerts but if you go to the festivals and the country dances, they’re full to the brim of young people and every age group. Cliona last night danced her way through to the next round of RTÉ’s Dancing with the Stars. Cliona and dance partner Robert were praised by the judges for “smoldering with their rumba”, as they danced their way through to next weeks show to Rita Ora’s Let You Love Me. It was the first week where all eleven dancers performed their individual dances, with Cliona and Robert scoring 20 points out of 30 for their routine. Judge Julian Benson said it “was a ridiculously raunchy rumba from start to finish”. “The chemistry was wonderful… it was mesmerising,” he added. Cliona also told of how she had invited Tyrone model Kate Grant to join her on last night’s show, who was seen sitting in the audience of Dancing With the Stars after Cliona had surprised her with tickets the evening before on The Ray D’Arcy Show. The 20-year-old, who recently became the face of global beauty Benefit had previously told of how she had five goals for the new year, including attending the show to see her idol Cliona Hagan dance. Kate said “it was a dream come true” to watch her friend perform, telling the Belfast Telegraph: “This meant so much to me because I love Cliona and her singing. She really inspires me”. The first unlucky couple to be voted out of the competition last night was Eilish O’Carroll. 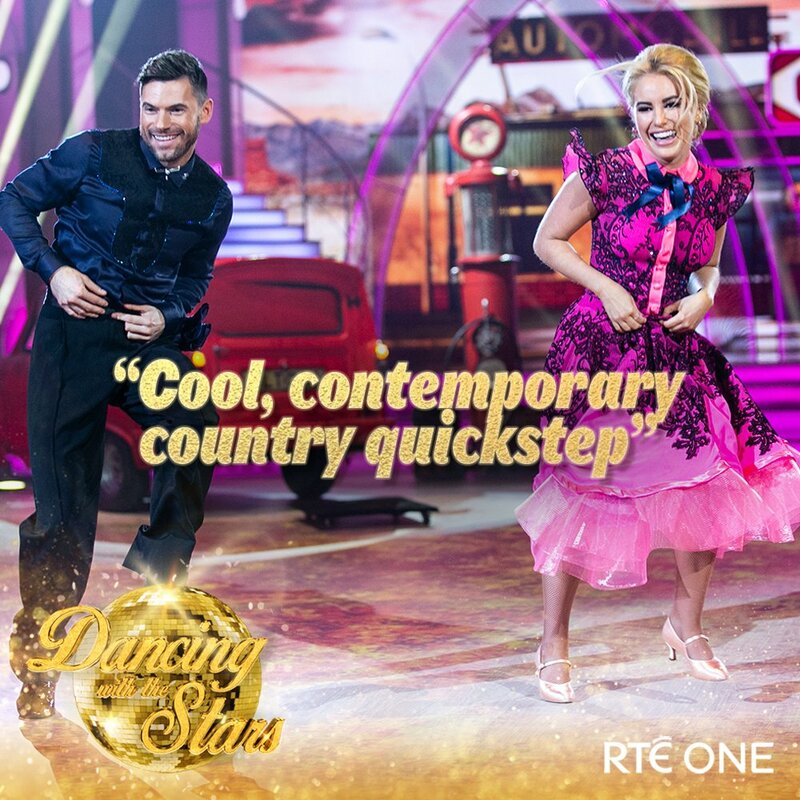 Cliona and her professional dance partner Robert Rowiński wowed judges on Dancing with the Stars Ireland last night with their “cool, contemporary country quickstep”, earning them the top spot on the leaderboard. It was the ladies turn last night to take to the dance floor to show off their fancy footwork in the second episode of the new season of DWTSI. The biggest critic on the show Judge Brian Redmond praised the “energy and fun” Cliona brought to the night, with Lorraine Barry commending the partnership for the “hardest dance you can do”, adding “it was fantastic”. Cliona stormed to the top of the leaderboard with 21 points from the judges. Swapping her country shoes for dancing stilettos – this Sunday 6th January, country music star Cliona Hagan will step out of her comfort zone and take to the dance floor on Dancing with the Stars Ireland RTÉ One – hoping to claim the much-coveted Glitterball trophy at the end of the series. Each dancing pair will have a different genre to master every week from the paso doble to the waltz and they’ll have just seven days to perfect their routine, before performing live to the nation. Cliona could be a contender – Paddy Power have her at 8/1 to WIN, but she needs her fans support as the series will run for 12 weeks, wrapping up on Sunday 24th March. With a new presenting duo of 2FM regulars Jennifer Zamparelli (replacing Amanda Byram) and Nicky Byrne, an interesting mix of contestants, and the return of the regular judging line-up, this third series may prove to be the best yet. Good luck Cliona and keep dancing! [Also set to take part in the third series for the race to the coveted Glitterball trophy include: Peter Stringer, Cliona Hagan, Demi Isaac Oviawe, Clelia Murphy, Mairead Ronan, Johnny Ward, Eilish O’Carroll, Denis Bastick, Darren Kennedy, Fred Cooke and Holly Carpenter].